This is the second Don Lee (aka Ma Dong Seok) film of the month. November had the release of <The Villagers> on the 7th, as well as this, <Unstoppable>, set to release on the 22nd. I was invited to attend the pre-screening and cast greeting, and therefore was able to see the movie 2 weeks prior to its wide-release. I saw the two Don Lee films back-to-back; <The Villagers> on the 7th and <Unstoppable> on the 8th. Thus, I was able to compare the two movies with the memory of the first film still fresh in my memory. <Unstoppable> was director Kim Min-Ho’s debut feature film, starring Don lee, or Ma Dong Seok, alongside Song Ji-Hyo as the main cast members, and Kim Sung-Oh, Kim Min-Jae, Park Ji-Hwan, Bae Noo-Ri, and Lee Sung-Woo as the supporting casts. The literal translation of the film is “Angry Bull,” which perfectly suits the buff, powerful character of Don Lee. The movie is set to release on November 22nd 2018 in South Korea, two weeks apart from <The Villagers>, another Don Lee movie with a very similar premise. In this review, I’ll be comparing the two movies a lot; it’s hard not to, as the release of the two films are very close to one another, stars the same main actor, and has an extremely similar storyline. After having a rough and thuggish life, Dong-Chul (Don Lee) shifts his life around 180 degrees after meeting his wife, Jisoo (Song Ji-Hyo). He now lives a normal, dedicated life, working at a local fish market. That is, until his wife is taken by unknown men. A report is filed with the police, but nothing really comes of it. Suddenly, he receives a call from the kidnapper (Kim Sung-Oh). However, this abduction is different from common ones; rather than the abductor asking for ransom money, he instead gives Dong-Chul a hefty amount of cash as payment for taking his wife. 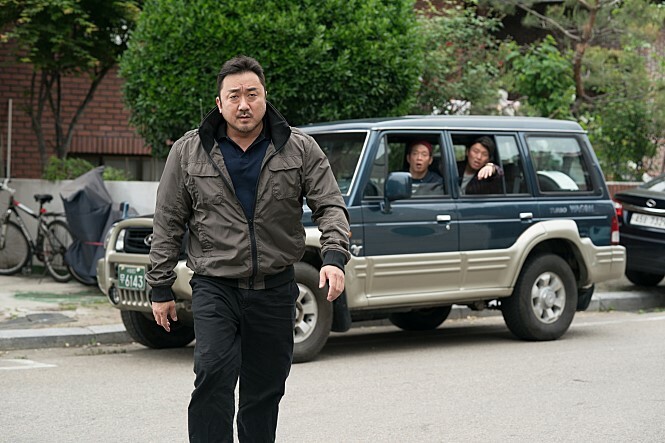 Enraged by this, Dong-Chul starts to track down the suspects in order to get his wife back, with a vengeance to show that he’s not someone to be messed with. All-in-all, this was a great movie to watch with a light attitude. I mentioned in my review on <The Villagers> that that film had a good balance of essential elements, such as comedy, action, suspense, and mystery. Well, this had an even better one. I thoroughly enjoyed this much more than <The Villagers>; although I came out of the theaters pretty satisfied with <The Villagers>, this just blew every bit of contentment I had with <The Villagers> and replaced it with <Unstoppable>. Yes, the two stories were fairly similar, but <Unstoppable> was funnier, had better suspense, was more realistic, had a more solid story, and I preferred the action in this more so than in <The Villagers>. A huge negative I had of <The Villagers> was that it lacked story and character development. This didn’t have a problem with that. Of course, there’s always room for improvement, but this didn’t have half as much of a problem than the other. Furthermore, it was a lot more fast paced as well. The story progressed at an optimal speed, not boring the audience nor moving too fast where it loses the viewers along the way. I feel like it had all the “goods” of <The Villagers>, and fixed the “bads” of it. The title of the movie perfectly depicts Don Lee: Unstoppable. He’s a beast and cannot be stopped; a punch is all it takes for him to get his way. His action sequences are very, very satisfying. Just watching him knock people out gives a strange amusement that’s hard to explain… As if a longing burp was finally released lol. In addition, the acting by the other cast members were fantastic as well. I can’t recall a single actor that wasn’t good in it. I hadn’t seen Song Ji-Hyo in a lot of movies, only just a few smaller roles in movies like <New World>. But seeing her play one of the main characters in this really showed her true talent and skills. I do hope we can see more of her works in the future. And although she is a main cast in this, she doesn’t appear as much as I’d hoped for. Kim Sung-Oh appeared on screen more than her, and he’s a supporting cast member. Speaking of Kim Sung Oh, he was another great performer in <Unstoppable>. 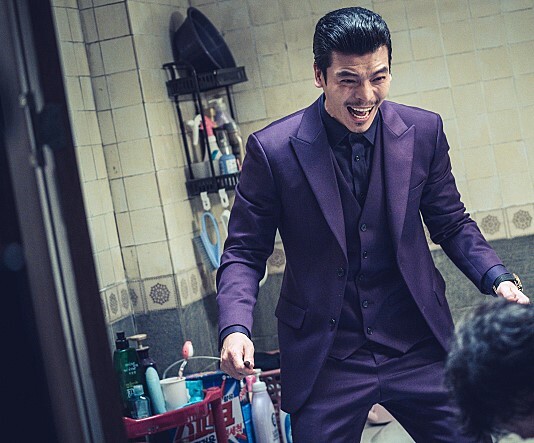 In the movie posters and screen cuts released for promotional purposes, he seemed like a Korean version of “The Joker” from <Suicide Squad>: a purple suit and pulled back hair with an eerie smile. It seemed very cliché and too much of a copy. However, Kim Sung Oh’s acting was surprisingly great, and didn’t seem like a replica of the Batman villain that I had expected. One additional small comment that I have is that I really enjoy when they play extra scenes as the credits come out, as they did with this. These extra epilogues give sort of an “encore” type of feel to the conclusion of a movie, and keeps the audience’s attention a little while longer than when only the credits go up. As mentioned in the <The Villagers> review, Don Lee has created a genre of his own. I don’t think anyone else can play the roles that he does in Korea. Can you think of a single actor that could fill his shoes? It almost feels like he’s casted before the movie is even written… As if the movie is made revolving around Don Lee and the image he has. I’m not saying that this is bad. No, mad respect to Don Lee and what he’s been able to accomplish. However, I will say that he’s essentially the same character in everything he’s in. From <Train to Busan> to <The Outlaws>, <The Soul-Mate> to <The Villagers>, and now this, he’s basically a thug-like person with a very soft heart in every production. In continuance, because he’s virtually the same character in everything he’s in, I feel like it will become overplayed sooner or later. The whole “untouchable” machoman was good up until this point, but there were two of basically the same fundamental movies just in the month of November, one in September, and two more earlier this year. From 2017 to 2018, he was in 8 movies total (there’s actually two more of which he stars in that’re in the works! ), which isn’t a bad thing, but the slightly unfortunate part about it is that he was basically the same role in all of them. Hopefully the next productions can give us something more new and original, expanding and broadening Don Lee as an actor. If you have to choose between <The Villagers> and <Unstoppable>, I’d definitely go with <Unstoppable>. It was funnier, had better action and story, and was just overall a more enjoyable movie. Although the story itself is pretty obvious, it’s great for a fun, light watch. If you want more of a deep, thought-provoking film, <The Villagers> may be the better way to go.